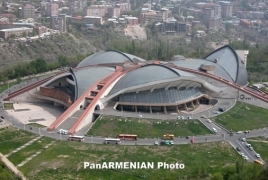 PanARMENIAN.Net - Karen Demirchyan Sports and Concerts Complex nonprofit organization, currently belonging to the Republic of Armenia and RA Defense Ministry, will be sold to NTAA Investment Group LLC at a price of $30 million. According to the government’s decision, the buyer is bound to cover costs of property’s valuation worth AMD 2,120,000, engage in at least 6-month labor contracts with 99 employees currently working at the facility with monthly minimum wages of AMD 55,000, organize up to 5 events on government’s request per year within 10 years’ span. The company must also ensure the people’s right to access Tsitsernakaberd, the Armenian Genocide Memorial freely. By acquiring the Sports and Concerts Complex and redeveloping the surrounding areas, NTAA Investment Group LLC plans to implement a major investment project, total value of which exceeds $100 million. The investment project is scheduled to be implemented within 4 years: the complex will be renovated and turned into a family-oriented center, which will be the first of its kind not only in Armenia, but also in the region. The complex will include hotels, indoor waterpark, concert halls, meeting rooms, restaurants, shops and a casino. The hotels will have more than 350 family rooms, the indoor waterpark will cover an area of more than 18,000 square meters and will operate round-year. The project will provide at least 250 new jobs. The company must also contact international record labels, such as Virgin Records, Sony Records, EMI, while concert centers should cooperate with stars.